Texas A&M ended tonight with a devastating 99-72 loss to Michigan as its fate was set from the start. This semi-final regional matchup between No.9-seeded Texas A&M Aggies (22-13) vs No. three-seeded University of Michigan Wolverines (31-7) is took place in Los Angeles, Calif. 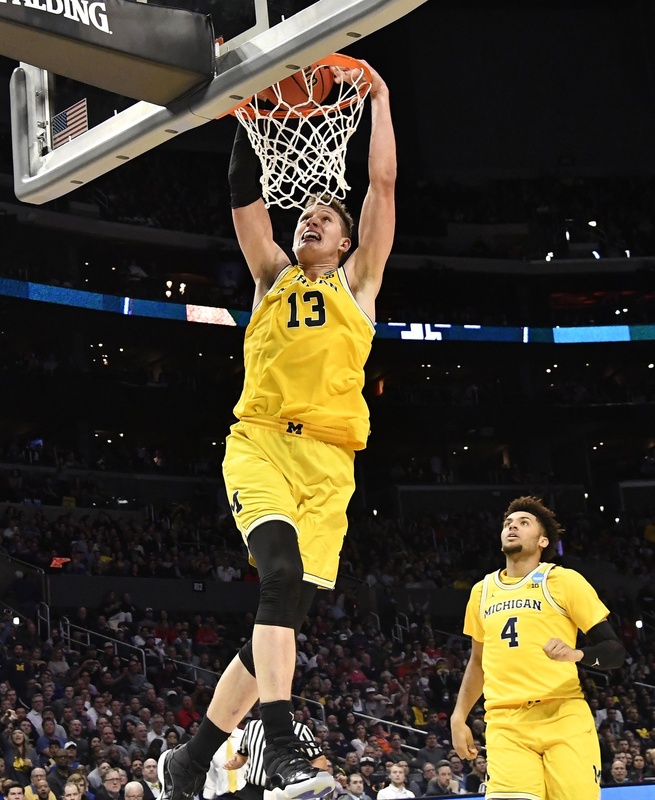 Yet, from the stands and loud yells after every good play it felt like a home game in Crisler Arena back in Ann Arbor, Mich.
Jordan Poole and Muhammad Ali Abdur-Rahkman both hit three pointers to begin the game. Michigan took an early on the Aggies, jumping out to an early 16-6 lead not even half way through the first half. The downpour of shots didn’t stop through the first half as Michigan worked the ball to every corner of the floor before finding a good shot. Abdur-Rahkman boosted the team to a huge lead in the first half, with a great all around effort of eight points, three rebounds and five assists in the first period of action. Abdur-Rahkman not only played well on offense he made scrappy plays on defense, drawing a charging call while up by more than 20 points. That kind of relentless play was a team wide action for the Wolverines. Junior forward Moritz Wagner played the passing lanes and diving on the floor a loose ball, keeping the pressure on the way to a 52-28 lead at the half. The Aggies began the second half with three consecutive trips down the floor with points. A well-timed tip-dunk by sophomore forward Robert Williams. Tyler Davis added a dunk of his own to bring the score just a little closer. The spurt in offense began with a full court press initiated by coach Billy Kennedy, which caused two quick turnovers for A&M. Michigan kept its foot on the gas pedal in the second half as it got five players in double figures— not only in volume but in efficiency. The Wolverines ended the game shooting 61.9 percent from the field and never allowed the Aggies to get close in route. One bright spot for A&M was the play of junior center Tyler Davis; shouldering 17 points, gathering and eight boards and a blocked shot. Michigan’s continued fate will be decided Saturday as it takes on the winner of the No. 4-seeded Gonzaga (32-4) vs. ninth seeded Florida State University (22-11) in the evening’s later game.